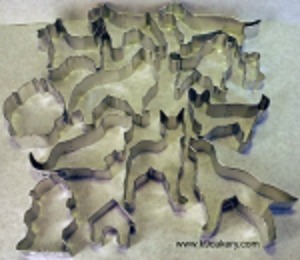 Use dog themed cookie cutters to make special dog treats for fundraisers. We show you various designs from which to choose! dog paw shape - 1.5"
If you want to make even smaller treats, this cookie -set offers teacup size cutters. The set includes 12 various shapes, each 1/2 inch in size. It includes its own metal storage container as shown in the image above. The image on the right depicts the cutters inside the container. 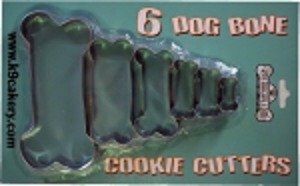 Use this set of six different sized dog bone cookie cutters to make a display of dog bone shaped treats. The cutters range in size from 1.5" to 5.5" giving an opportunity to create treats for small, medium and large pets. The cutters are made of metal. 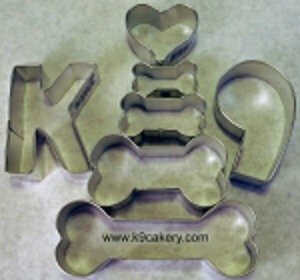 Dog bone cookie cutters in three sizes - 1.5", 3", and 4.5"
Fire hydrant cutters in two sizes - 3" and 1.75"
One paw shaped cookie cutter 3"
4 dog bone cookie cutters to make dog bone shape dog treats for every size dog - 4.5", 3.25", 2". 1.5"
As a treat for larger dogs, make them their own edible squirrel! This is one critter you won't mind that they catch. Squirrel shaped dog biscuits are bound to be a conversation piece. This cutter is 3" in size. 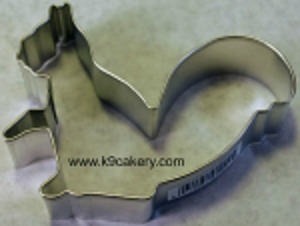 This set of Linzer cookie cutters makes a wonderful gift for a dog loving friend who enjoys baking and decorating. Linzer cookie cutters have cut outs in various shapes. This set includes 6 shapes: dog, fire hydrant, bone, dog house, puppy, paw. It also includes a dog treat recipe. 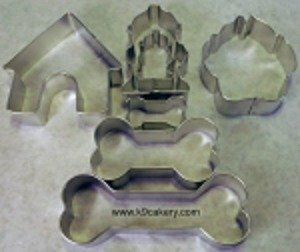 For free dog treat recipes to try your cookie cutters out, click the link.